RS Components is stocking the newly launched Lumileds Gen-4 Luxeon COB LEDs, enabling smaller, simpler luminaires to deliver bright and vibrant lighting. With efficacy of up to 170 lm/W, the industry’s smallest LES, and lower package thermal resistance than other COB (chip-on-board) LEDs, lighting designers using Luxeon Gen-4 LEDs can create new styles featuring denser arrays, smaller optics and simplified construction. In addition, colour consistency within a 3-step MacAdam ellipse gives freedom from binning to simplify component purchasing and luminaire production while ensuring uniform appearance from unit to unit. 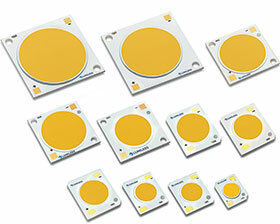 High colour fidelity is another strong suit of the latest Gen-4 Luxeon COB LEDs, which have a CRI of up to 90. Consistent rendering of all wavelengths makes them ideal for colour-critical lighting in areas such as retail displays, showrooms, healthcare centres, laboratories and industrial-inspection areas. Applications like high-bay and low-bay lighting, downlights, spotlights, and architectural or general outdoor lighting can also benefit from the brightness, clarity and efficacy of Luxeon Gen-4 LEDs.